If you immediately change your entire diet, it will backfire as you experience cravings and it feels like a punishment. I only bring breakfast from home about 3 times a week and the rest are normal. Don't overdo it especially when you're just starting. 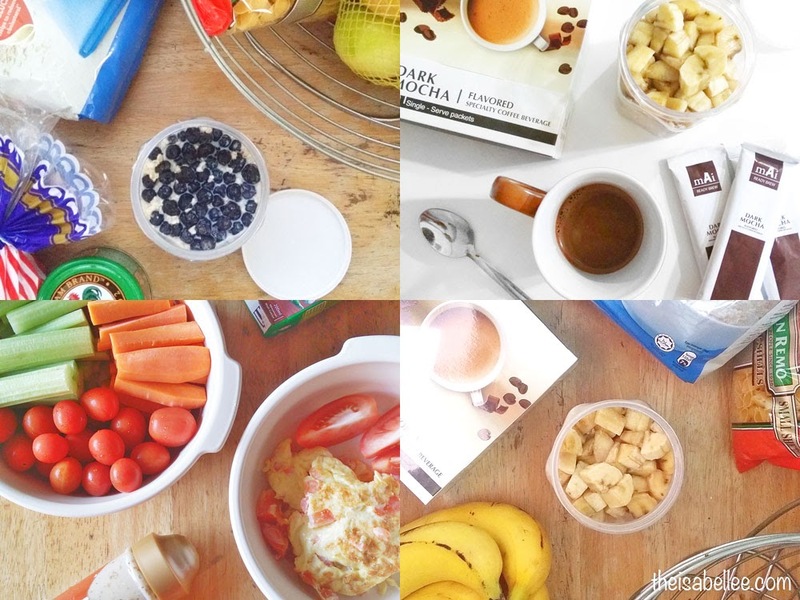 Here's a healthy breakfast you can whip up in minutes the night before! With all the sotong I eat, my body will definitely appreciate the oats. I used to chug oats everyday and it was grossing me out but I found a way to make it enjoyable. I see many overnight oat recipes online but I like keeping it simple. Just pour your oats, milk and fruit into a jar then chuck it into the fridge overnight. 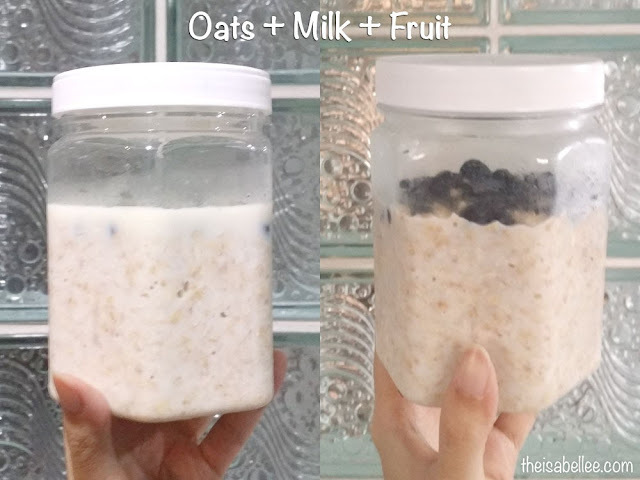 You don't even need to cook the oats as it will soak up the milk and soften. I don't add maple syrup or honey as I feel it's unnecessary sugar. Just pick sweet fruits to go with it! 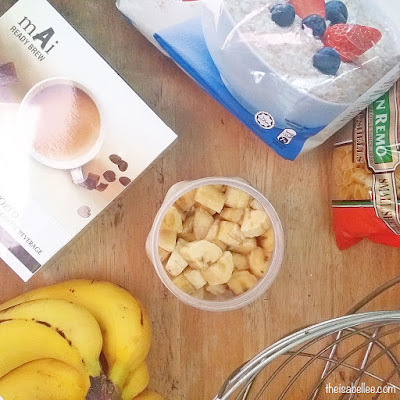 My favourite fruits to go with oats are banana, blueberries and strawberries. These are naturally sweet and just perfect. I would recommend adding the bananas in the morning though as they turn brown quick. LOL For someone who can't cook, salad and eggs are awesome! My salad is basically chopped up raw veges but you can add nuts, chickpeas, tuna, olives or pasta. The combination of veges are totally based on your preference. I just take whatever that's available and fresh at my local market. It's hard to buy groceries for one and I usually have leftover. I can't exactly be eating the same veges for the whole week so... I mix it up by chucking everything into a blender LOL Somehow this works and tricks my mind into thinking I'm having a treat even though the contents are the same. "Omg why are you still drinking coffee?!" Remember I'm taking it slowly.. Coffee is part of my life! 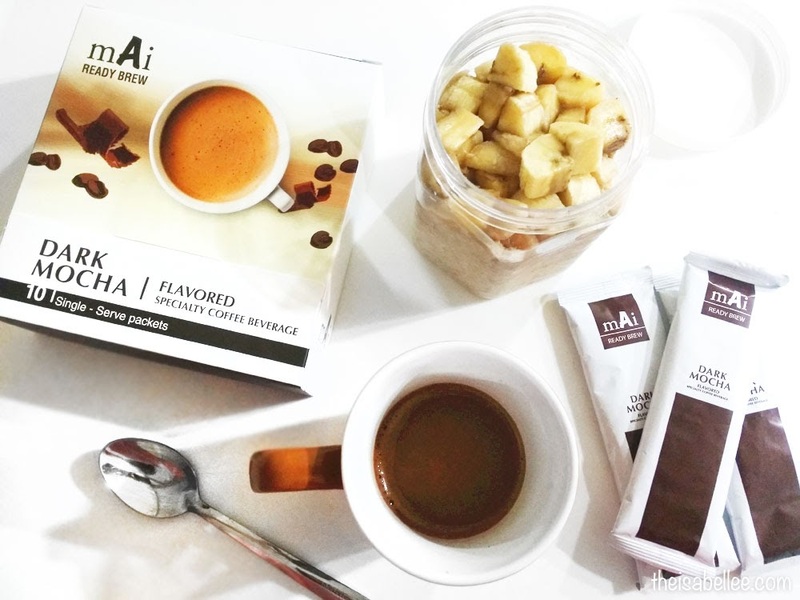 Replacing it with mAi Dark Mocha still satisfies my cravings but helps me control my diet at the same time. It has a total of 8 benefits - regulating appetite, improving basal metabolic rate, burning the stubborn fat, increasing body muscle mass, elevating body energy, preventing fat reformation, targeting lower body especially abdominal area and zero by-effects on human body. Don't expect them all to happen together though. Since I only had supply for 10 days, I guess I would only experience the effects of the first week - reduced body swelling and elevated body metabolism. Even though I've only made small changes, I'm glad to report that I'm happy with my breakfast plan and my tummy has gotten flatter! The mAi Dark Mocha prevents me from overeating as it controls my appetite. It's important to note that this is not a meal replacement so make sure you still eat proper food! 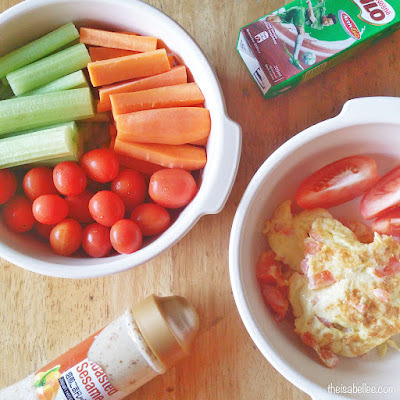 Great to know that you are starting eating clean. It's a long and tedious journey, but it's sure worth it. All the best, babe! love to eat breakfast. its must have in the morning. wow got this mocha, no try yet. omg..i really need this! getting so fat nowadays..always breakfast with non healthy food..huhu..thanks! 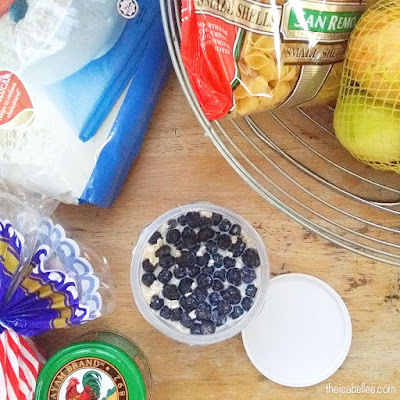 I love overnight oats and had that quite often as my daily breakfast. Plus coffee is a must to kick start my engine. I always skip breakfast but dont have any ideas to change my habit. Thanks for your tips... gonna try it and stay healthy. Appreciate your tips. Every morning wondering what to prepare for my breakfast is quite hassle. Keep the post coming.